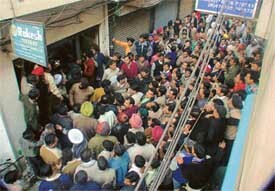 Four officials of a raiding Central Excise team had a narrow escape after they were gheraoed by a strong mob of over 500 angry traders in the Mochpura market here today. Angry traders outside KS Trading Company at Mochpura Bazar in Ludhiana where they gheraoed four excise officials who had come to conduct a raid on Friday. Coming as a shot in the arm of the authorities of Sacred Heart Convent School here, the district police has booked a youth Akali leader on the alleged charges of presenting fake birth certificates for the admission of his son to the school. Steel manufacturers have criticised the National Democratic Alliance (NDA) government for recommending dissolution of Parliament without providing them any relief. They alleged, “it appears to be free all for except the steel and pig iron producers”. They said, instead of tying the hands of steel producers from exploitation, the government had instead tied its own hands by dissolving the Lok Sabha without taking action on the iron and steel prices. The Deputy Chief Minister of Punjab, Ms Rajinder Kaur Bhattal, has said the state government has chalked out a comprehensive programme for the repair of 7,000 km roads and funds amounting to Rs 800 crore were being spent for this purpose. She was addressing a gathering on the concluding day of the Rural Sports Tournament before distribution of prizes at Ottalan village, about 40 km from here, today. The Bharatiya Janata Party (BJP) will contest the coming Lok Sabha elections on the issue of development in the country during five decades and historic leaps forward under the five-year regime of NDA government headed by Prime Minister Atal Bihari Vajpayee. 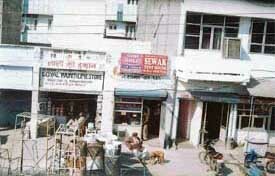 Despite the fact that the Punjab and Haryana High Court had taken a serious note of the increasing tendency of encroachments on government and municipal land in the mega city and explicit directions issued to the civic body to clear these unlawful structures in a time bound manner, the menace of unlawful construction and encroachment on public property continues unabated. Punjab Minister for Jails Malkiat Singh Birmi has asserted that the state was all set to provide 24-hour power supply to the remaining 5500 villages out of the total 12,700 villages in the state positively by the end of June 2004. The Punjab State Government Pensioners Confederation has demanded the merger of 50 per cent of the dearness relief into basic pension on the pattern of Central Government employees/pensioners. The benefit has been announced in the interim budget presented by the Union Finance Minister keeping in view the recommendations of the Central Fifth Pay Commission Wednesday. The local police has arrested Ravinderjeet Singh and his wife Sukhpreet Kaur, both residents of Badinpur village, under Section 364A, IPC. This information was given by Mr Shiv Kumar Sharma, SSP, Fatehgarh Sahib, at a press conference held at the local police station today. Jaspal Singh, alias Jassa, a resident of Lohatbaddi village in Sangrur district, now living in Gurpal Nagar here, was nabbed by the Shimla Puri police yesterday and booked under the NDPS Act. The police said today that the accused was arrested after the recovery of more than 104 kg of poppy husk from his possession. The agitating workers of Avon Cycles, presently under lockout, have sought the intervention of Shiv Sena (Bal Thackeray) for acceptance up their just demands and reopening of the factory. Among other things they have called for reinstatement of three workers, who were sacked on Jan 13, 2004, a few days before the factory owners declared a lockout. The Department of Farm Power and Machinery, College of Agricultural Engineering, Punjab Agricultural University, will organise the 15th workshop on “Farm implements and machinery” from February 10 to 13. The Education Department has initiated a process to scrutinise all textbooks of elementary classes from content and gender sensitisation point of view. Educational organisations and women welfare societies have welcomed the government’s move to remove gender bias from education. Members of the Save Elementary Education Front, Punjab, comprising eight different unions of primary teachers of Punjab, will stage a dharna in front of the Director of Primary Education, Punjab on February 11 to protest against his announcement at Gurdaspur to establish one school in one village. The Punjab State Electricity Board has preferred an appeal against the order of the Punjab and Haryana High Court in the Supreme Court through which the Punjab State Electricity Regulatory Commission was restrained from giving effect to power tariff hike with retrospective effect. The District Consumer Forum has directed the New India Assurance Company to pay Rs 10,093/- along with 9 per cent interest to the aggrieved consumer as it had failed to settle the mediclaim within reasonable time. The forum also directed to pay Rs 1,500 as costs. The 30th annual athletic meet for boys of Guru Nanak National College, Doraha, concluded here today. Mr Amrik Singh Minhas, DSP, Payal, inaugurated the meet. He asked the athletes to work hard in their field and with a true sportsman spirit face the obstacles in the most enduring manner and fight towards their fixed goals with single-minded devotion. Bullockcart races, kabaddi and volleyball were the main events in the four-day annual sports festival organised by the Baba Naungarhia Sports Club at Veelan village, near here. In kabaddi (57 kg and 52 kg), Veelan emerged victorious, while in the 47-kg category, Sehjat came out triumphant and in the 42-kg category, Shaal lifted the title. The second edition of the annual sports meet at the Bhartiya Vidya Mandir School, Chandigarh Road, was organised here yesterday. Ms Sudesh Verma, a basketball coach, was the chief guest on the occasion. A warm welcome was accorded to the contingent of judokas from Pakistan who halted at the local railway station on Thursday night. The office-bearers of the Ludhiana District Judo Association, led by its president, Mr Devinder Singh Walia received the members of the Pakistan judo team.